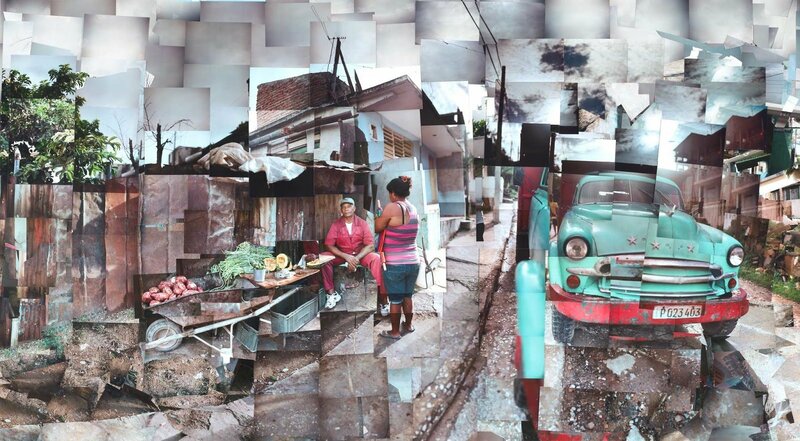 Cuba in Transition: Narrative & Perspective is a new exhibition of large-scale photo-collages and interviews by Northampton-based artist Mark Guglielmo running from June 1—25, 2017 at A.P.E. Gallery, 126 Main St, Northampton, MA with an opening reception on Friday, June 9 from 5-9PM (Arts Night Out). Each collage measures 5 to 15 feet long and is handmade by taping together hundreds, sometimes thousands, of individual 4×6” photographs. Neither a computer nor Photoshop are used. Culled from dozens of audio interviews Guglielmo recorded and conducted in Spanish, diverse Cuban voices and perspectives are presented on portable mp3 players. Curated by Waleska Santiago-Centeno, it is the New York-born artist’s second exhibition with the gallery. It will travel to Cienfuegos and Trinidad, Cuba in January 2018.